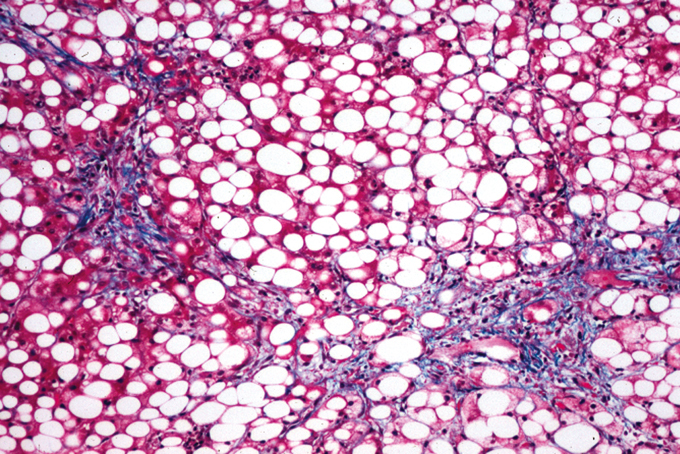 Gilead Sciences has acknowledged that its lead liver disease candidate selonsertib (formerly GS-4997) has failed a Phase III trial in nonalcoholic steatohepatitis (NASH). Selonsertib missed the primary endpoint in the Phase III STELLAR-4 trial (NCT03053063) by failing to meet the pre-specified week 48 primary endpoint of a ≥ 1-stage histologic improvement in fibrosis based on the NASH Clinical Research Network (CRN) classification without worsening of NASH, compared with placebo. According to topline data released by Gilead, only 12.5% of the 351 patients treated with selonsertib at the trial’s lower dose of 6 mg achieved the ≥ 1-stage improvement in fibrosis after 48 weeks of treatment, compared with 12.8% of the study’s 172 placebo patients. In addition, 14.4% of the 354 patients treated with selonsertib at the higher dose of 18 mg achieved the ≥ 1-stage improvement in fibrosis after 48 weeks. Gilead said that further in-depth analysis of the findings was ongoing, and that data will be submitted to an unspecified upcoming scientific conference. Gilead will work with the trial’s Data Monitoring Committee and investigators to conclude the STELLAR-4 study “in a manner consistent with the best interests of each patient,” the company added. A total 877 enrolled patients received selonsertib in STELLAR-4, a randomized, double-blind, placebo-controlled study evaluating the drug’s safety and efficacy. In addition to fibrosis improvement, the trial’s other primary endpoint was event-free survival at week 240 as assessed by time to the first clinical event. Selonsertib was generally well-tolerated and safety results were consistent with prior studies, according to Gilead. “While we are disappointed that the STELLAR-4 study did not achieve its primary endpoint, we remain committed to advancing therapies for patients with advanced fibrosis due to NASH, where there is a significant unmet need for effective and well-tolerated treatments,” John McHutchison, AO, MD, Gilead’s CSO and head of research and development, said yesterday in a statement. STELLAR-3 (NCT03053050), which is assessing selonsertib in patients with bridging fibrosis (F3) due to NASH. The ongoing 808-patient study was active but not enrolling patients as of the most recent ClinicalTrials.gov update on January 21. ATLAS (NCT03449446), a Phase II combination trial of selonsertib and two other Gilead drug candidates, the farnesoid X receptor agonist cilofexor (GS-9674) and acetyl-CoA carboxylase (ACC) inhibitor firsocostat (GS-0976) in patients with advanced fibrosis due to NASH later this year. The 395-patient study was active but not recruiting patients as of the most recent update on November 16, 2018. Selonsertib is a once-daily, oral inhibitor of apoptosis signal-regulating kinase 1 (ASK1) in patients with compensated cirrhosis (F4) due to NASH. ASK1 is a protein that promotes inflammation, apoptosis, and fibrosis in settings of oxidative stress. Selonsertib is also in Phase II development in diabetic kidney disease (DKD), while cilofexor is also in Phase II development for both primary biliary cirrhosis and primary sclerosing cholangitis. Gilead’s liver disease pipeline also includes a fourth candidate, the toll-like receptor-8 (TLR-8) agonist GS-9688, which is in Phase II for hepatitis B virus.